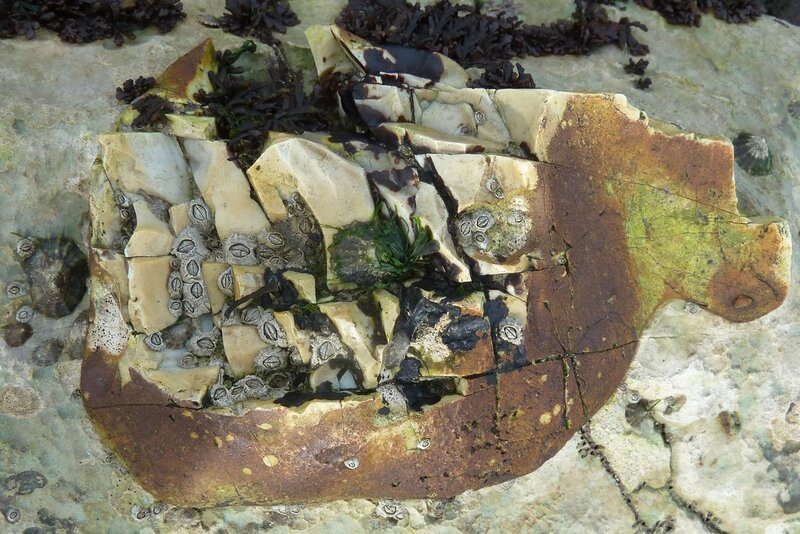 ​This was on Sidestrand beach in 2010 and is one of the nicest pieces of flint I have seen. It was not wet it just gleamed like it was. 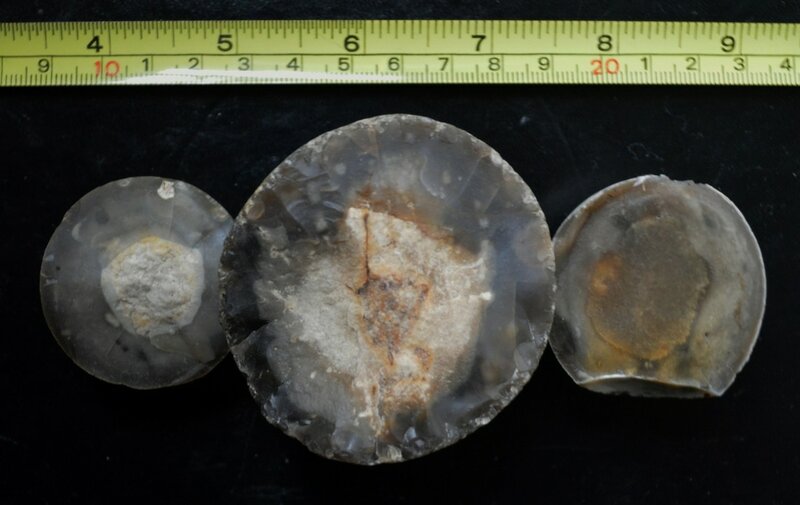 The majority of flint breaks in this curved, flowing way which is known as a conchoidal fracture as it mimics the pattern of a bivalve or mussel shell. Flints like this are a pleasure to knap as they break well and (almost) do what you want! Note the different surface to the rear of this nodule. Certainly not conchoidal. ​ A natural conchoidal fracture at West Runton. The shell like pattern is easy to see, many people show me these thinking they have found a fossil. The ripples are caused as the shock of impact travels through the cryptocrystalline structure of the rock. There is no grain or laminae to influence the way the flint breaks but inclusions such as sponge larvae or gemmules will affect the surface. The texture of this flint was creamy and it was an absolute treat to knap. The bulb of percussion is visible at the top with a bulbar scar which is indicative of being worked by humans. Ripple marks radiate away from where the platform was struck (I was using a small quartzite erratic) with a typical curl under at the bottom. Find John Lord and watch him knap flint or better still go to one of his workshops and try it yourself. A section of cortex left on the flint pictured above. Three natural conchoidal fractures, but when the force has meet the cortex a different fracture occurs this is called starch or columnar fracture and breaks in a square or rectangular section. Walter Shepherd 1972 likened these pieces to giant starch grains. ​Nice ripple marks on the natural fractures. 'Fresh' flint or protoflint breaks in this angular fashion. Sponges layered protoflint and it was softer and more maleable, almost as if they had not added a hardener. Many sponge larva grow on in the mesohyl gel, not all are released as male and female cells (gametes). Protoflint was intended to detach along with the larvae to act as embryonic, start-up protection. Ravendale tabular flint in Lincolnshire. Nice square fracture. A lot of tabular breaks in this same manner as protoflint, a directional flow can be detected in both the debris content and the fracture flakes. Top and bottom go in opposite directions and there are a lot of sponge body parts within. During the Cretaceous period the African plate was moving up to meet Europe and the Atlantic was opening up. Massive earthquakes and tsunamis would have sucked protoflint up and smeared it flat on the sea floor as tabular flint. Non volcanogenic marl seams form when the tsunami has rushed across land picking up soil. Frost will split a circular 'flake' off a derived nodule when the water inside the flint expands as it is frozen. ​Three flints picked up on Gunton. I left the mud on all three in true Walter Shepherd style. The white staining is 'Basket patination' where silica seeking grass roots leach the colour from the surface of soil flints. The soil acid has 'polished' the flint to a lustre like a finger nail. The bottom oval one is a pot lid fracture. Many of these are mistaken for stone age scrapers but it is the rings that give them away. ​A type 'A' nodule split by frost as the flint meal inside expanded. The main nodule is upside down and there are pieces of Inoceramus shell attached where the nodule had fallen onto them. I'd had this nodule for several years as part of this research and was quite annoyed when the piece spalled off one winter. ​ .........the flint meal interior was, at the bottom, turning to silica and is hard whereas the upper section is still chalky and can be scratched quite easily. The only time I have seen this. Also notice the leaf like, dendritic crystals of Manganese forming down the left side. Frost or permafrost deep freezing action is almost powdering the flint and causes this type of breakage. Close-up of the surface of hackly fracture. Sponge fossilised in flint. Gemmules (survival cell) just below centre but the one to the left has not fractured in the same manner, leaving a sphere protruding from the flat. surface. Top left of image is a larva being released from the osculum and leaving a trail as it was going. The lithification (turning to stone) of flint/sponge mesohyl must have been an almost instant process. ​...... the sponges internal organisation is revealed still connected to the outer layer (pinacoderm). This internal structure has influenced the way this flint, as seen above, fractured. This type of fracture is found a lot inside 'B' type nodules. The sponge larva inside has silicified but leaves a bumpy surface when cracked open in contrast to the surrounding flint. Close up of the B type on right, pictured above. The outer skin of flint has broken in a concentric manner, as a pot lid fracture would, but where the larva was, the central nubbly texture is picked out by the reflected light. There are two tails forming to the bottom and surrounding toxin deterrent is visible. The tails form 'nostrils' on the outer surface of B type nodules. at Selwick Bay in Yorkshire. Almost a starch fracture in geometry. They are supposed to be burrow form flint but it was more likely a burrowing sponge that existed just below the sediment surface so did not need to add the 'hardener' to prevent it being washed away. North Landing beach, Flamborough Head in Yorkshire. A lot of the exposed flints have this northerly trend in cracks and striations but not the chalk. The Cretaceous tidal flow had turned due north at this latitude so was that influencing sponge growth?